Over the past seven years I have had the chance to bring visual cards into group and team events. From keynote presentations with police departments, to conference events with HR professionals, to team coaching in the legal profession, to webinars with business owners and workshops with teams. Visual cards engage people in a whole new way and spark new conversations often leading to new insights and action! Since launching the Conversation Sparker(TM) deck in spring of 2014, the deck has made it's way across the globe to Iceland, Africa, Australia and across the Americas. These visual cards are being used by orchestras, hospitals, educators. Very quickly I started getting requests for more information on different and creative ways to use the cards. I am pleased to announce my latest e-manual 40 Ways to Use Visual Cards with Teams and Groups. the manual includes detailed instructions on how to bring visual cards into your work with groups. 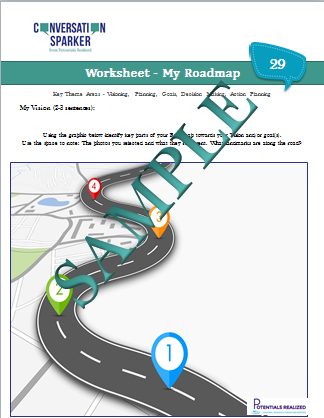 Five of the activities have an associated worksheet which you can use "as is" and duplicate for your groups. From openers, to closers, to strategic planning activities, team building activities and brainstorming approaches, the 40 Ways to Use Visual Cards e-manual will give you dozens more ways to keep your work fresh! I've spoken about the power of using visual decks to thousands of coaches, facilitators and trainers in the last decade. Whether you are using the Conversation Sparker Deck or are using one of the many other excellent resources - the JICT Deck, Visual Explorer, or the Coaching Game, you'll have many more ways to engage your groups and teams. Introductory pricing is $40 US (that's only $1 per activity!). Sample worksheet. You receive five different worksheets which accompany five of the activities. You can use them "AS IS" with your own groups and teams. Work is already done. Many of the activities can also be incorporated within individual conversations as well.